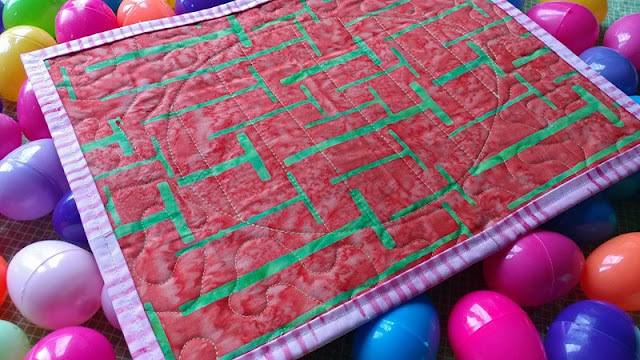 Slice of Pi Quilts: Happy Easter! I initially decided to do English paper piecing (EPP), which included glue basting and sewing the pieces together. 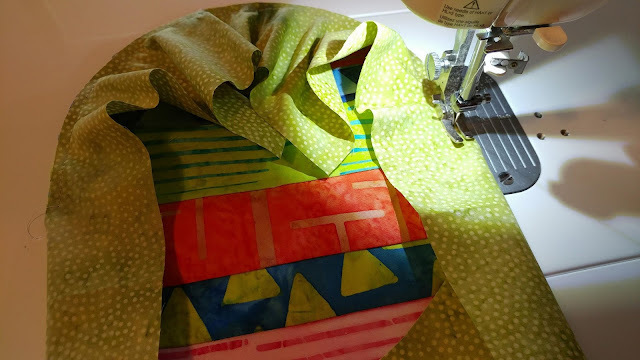 I normally despise hand sewing, but I've started to enjoy having something to work on when riding in the car or when a sewing machine isn't available. I have a really good start on that project, but as the end of the month neared, I knew I wasn't going to finish in time. I will keep working on it though and will show you just as soon as I finish! 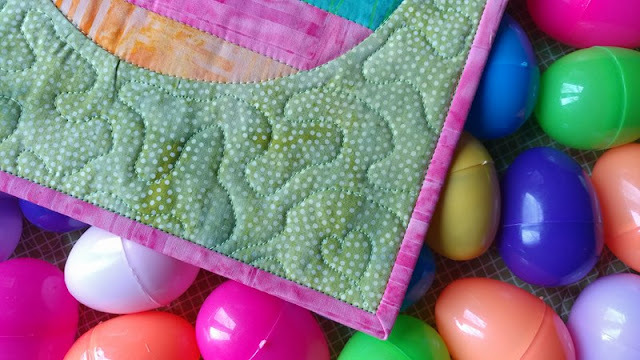 When brainstorming other ideas, I knew I really wanted to make some Easter mini quilts for my friends. It didn't take long for me to decide to attempt sewing an inset circle (well, egg). I started with a fat eighth bundle of Elementz fabric that Island Batik sent me as part of the ambassador program. 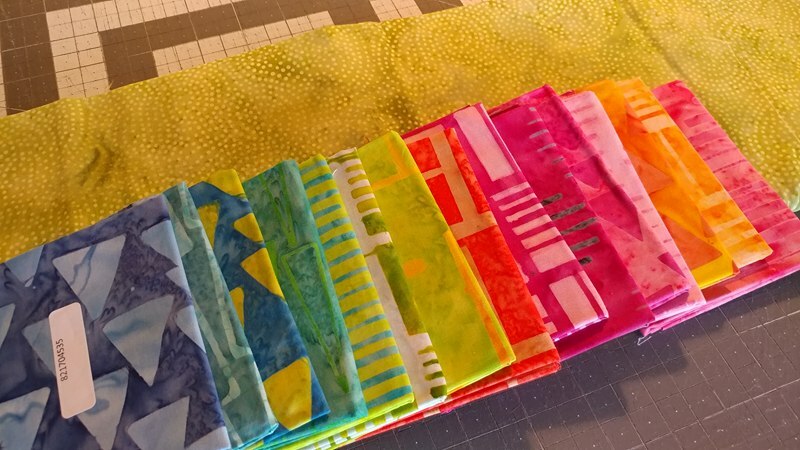 I picked out the colors that seemed spring-like and cut them into strips in various widths from 1 1/2" to 2 1/2". 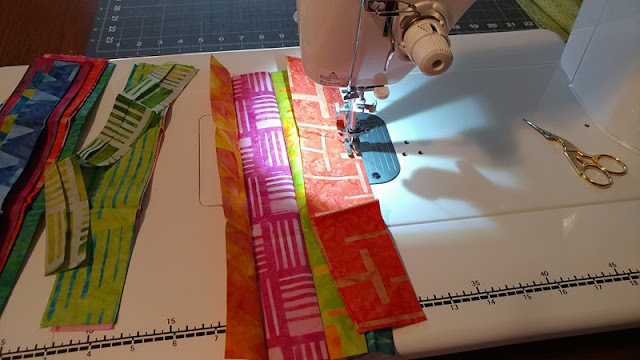 I pieced all the strips together using Aurifil 50wt thread in Stone #2324. Next, I printed an egg shape on my computer and cut four eggs from the strip set. 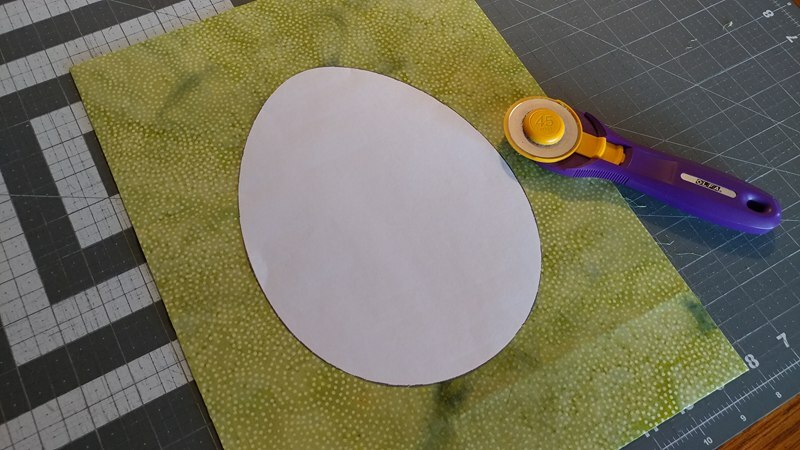 From a green dot blender fabric, I cut the same shape, but 1/2" inside the egg shape all the way around. 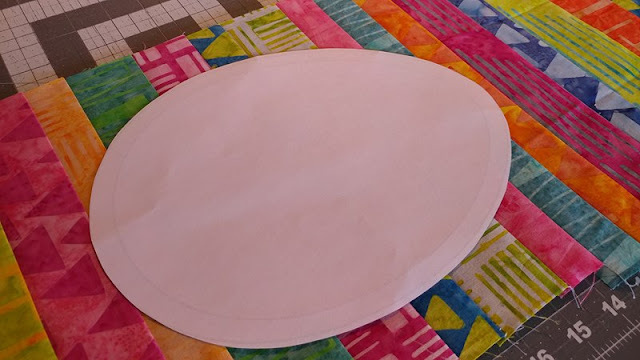 I found the center of the right side of the egg and the center of the right side of the background fabric, lined them up, and began stitching them right sides together. Once all the way around, the background fabric was all bunched up. But once pressed, they laid extremely flat! 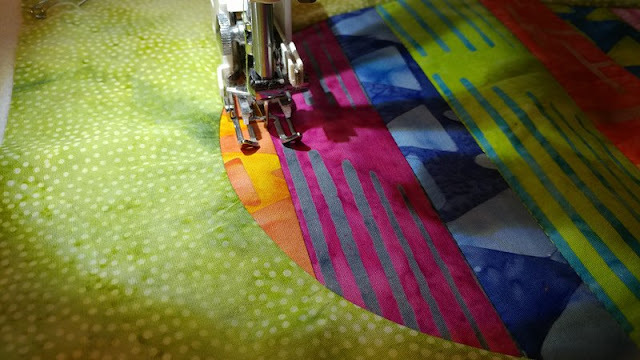 I could have clipped the seams on the tightest curves to help reduce puckering, but it wasn't bad enough to worry about it. I pin basted with extra fat eighths from the Elementz collection and Warm & Natural batting. I began quilting by stitching in the ditch of each strip on the egg using my walking foot. 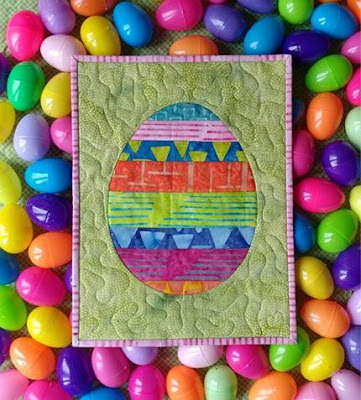 I also stitched in the ditch around the egg. 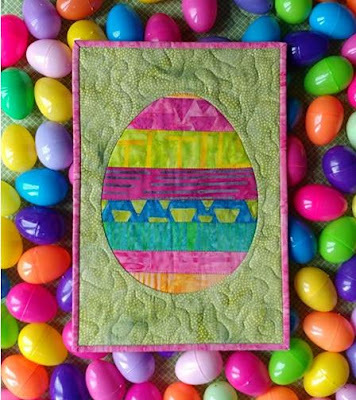 For the first egg, I used Aurifil 50wt #2479 Medium Orchid. However, I decided to stick with Aurifil 50wt #5017 Shining Green for all the rest. 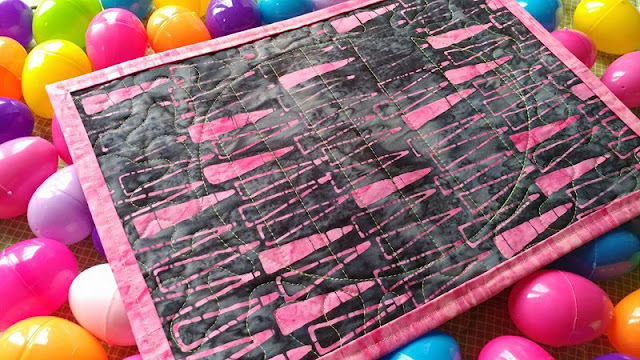 Once the eggs were quilted, I switched to my free motion foot to add meandering to the background. I bound each mini quilt with the leftover fat eighth pieces - by machine of course. Each mini quilt finished about 10" x 14". 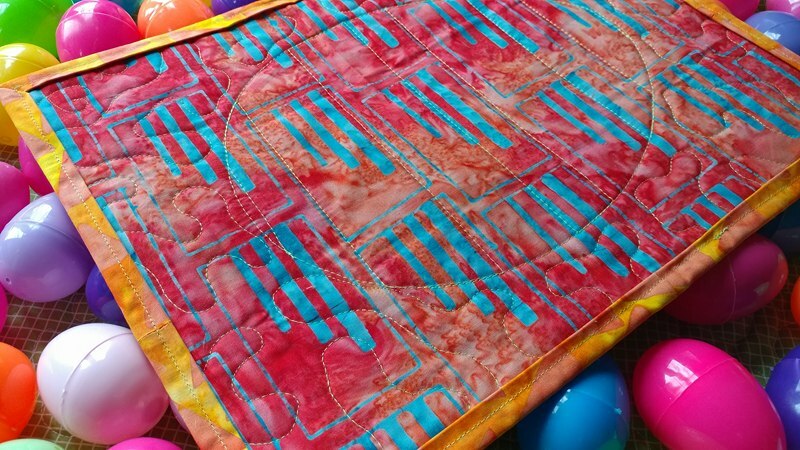 These are quilt finishes 13-16 for the year! 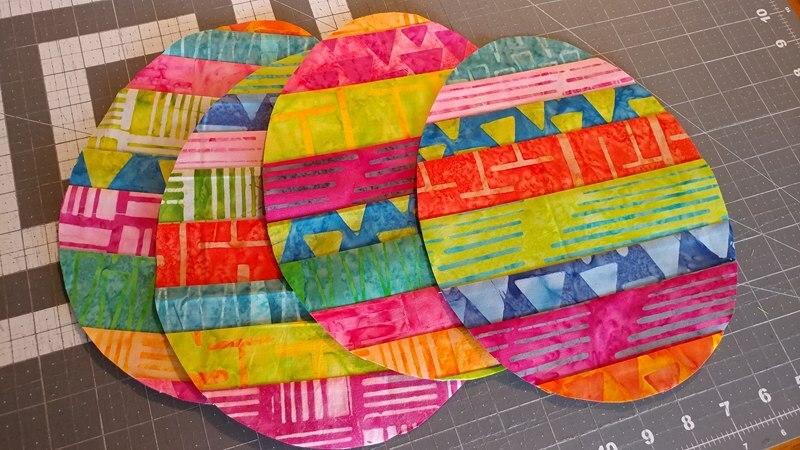 I'm very pleased with how the inset circles eggs turned out! 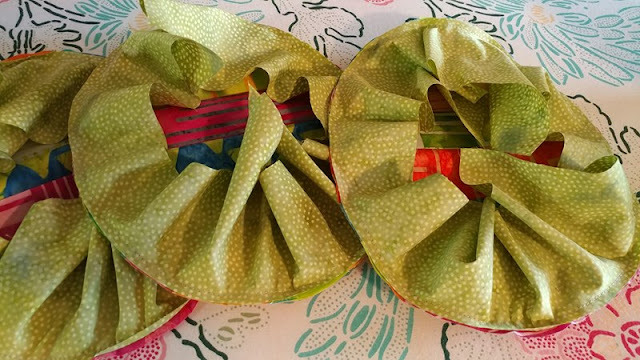 I love adding new techniques to my toolbox! Linking up with Wednesday Wait Loss at The Inquiring Quilter, Needle and Thread Thursday at My Quilt Infatuation, Finished or Not Friday at Busy Hands Quilts, Finish It Up Friday at Crazy Mom Quilts, Can I Get a Whoop Whoop at Confessions of a Fabric Addict, Friday Foto Fun at Powered by Quilting, and TGIFF at Cheeky Cognoscenti. This post contains affiliate links. Clicking a link will NOT effect the purchase price. I absolutely love these and Elementz is the perfect line for this project! These are egg-cellent! (haha, I couldn't resist!) 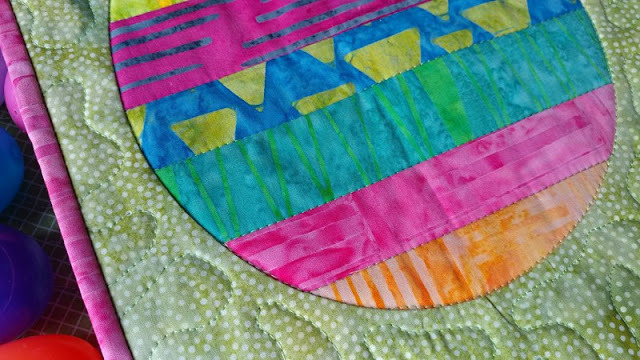 I think that the fabrics and colors for the project couldn't be any better. Happy Easter! Thank you so much for your process. 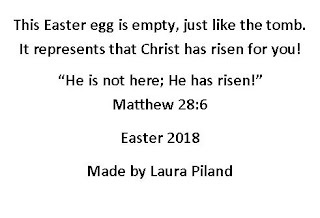 You made them look so good - and after seeing your process - I know I can make some and they'll turn out perfect... and Happy Easter! Wow, I love your eggs!!! I have never tried this technique...you make it look like something I might like! 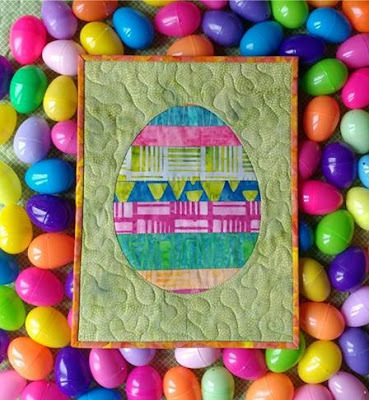 What great Easter projects. And the Elementz line is perfect for this. 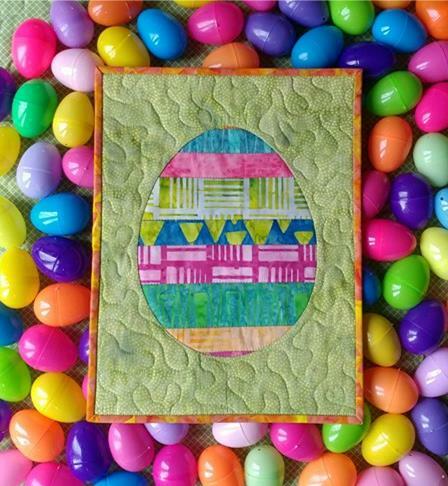 The colors and prints for Easter eggs! 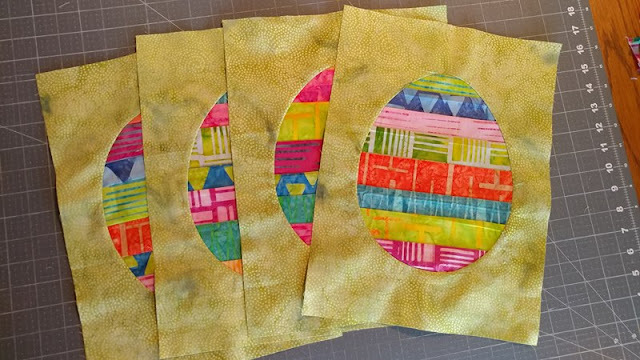 The batiks almost look like eggs that were written on my crayon and then dyed. 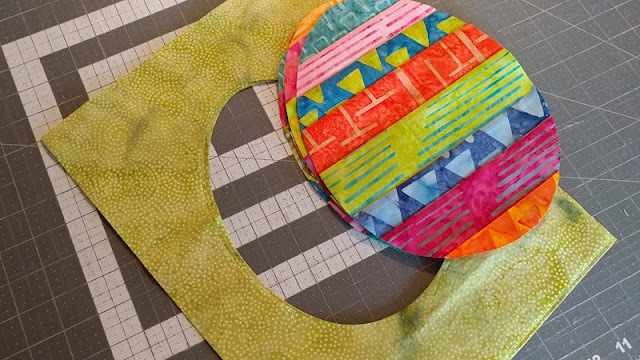 And your inset ovals (eggs) are perfect! And a wonderful message for Easter! Beautiful Easter eggs! 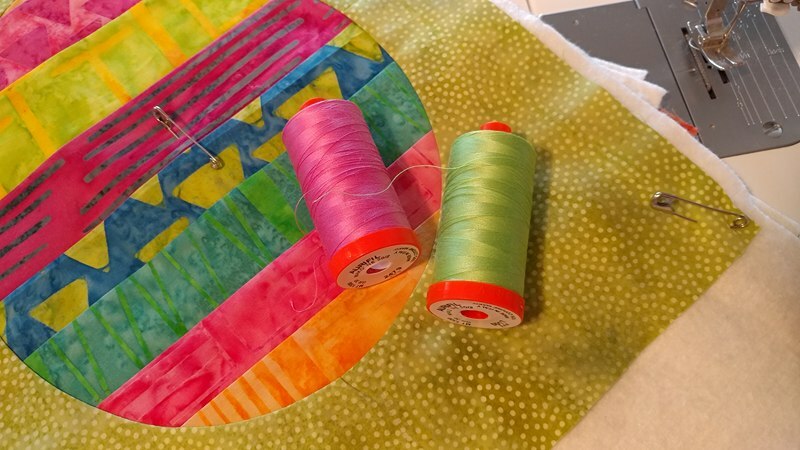 The fabric is colorful and perfect for the project. I wish I was on the receiving end of one of those cute eggs, with a wonderful message! Those Elementz fabrics are very cool. Happy Easter! 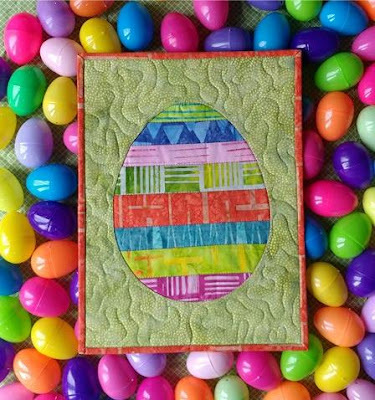 That fabric sooo lends it's self to your eggs! Great project, Laura!!! Happy Easter! 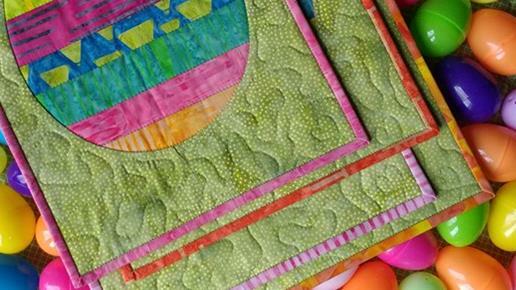 So neat and colors are so pretty - so creative! I just cannot bring myself to make things like this, but you do a terrific job at it! 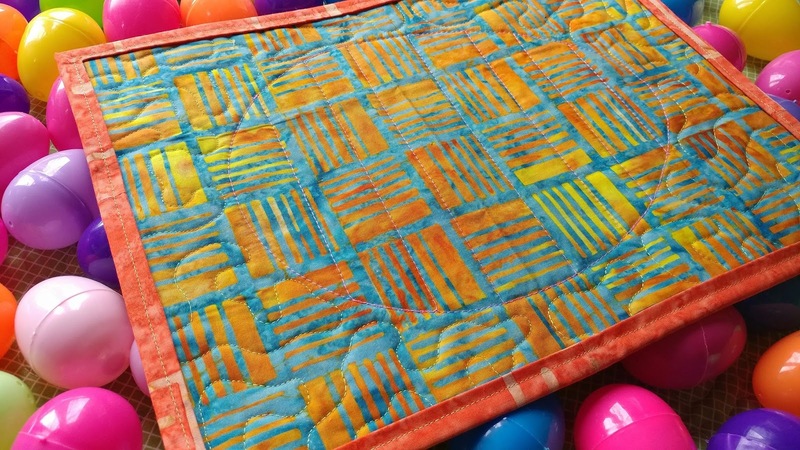 These turned into great mini quilts. Gorgeous fabrics. These eggs are so cute! Inset circles (okay, egg shapes) was a great technique to try! And you did it like a pro. I really love your photos...they really show off your great minis! Thanks for linking up to Wednesday Wait Loss. Just terrific. I love the way the inset egg shape worked out. The Elementz line was just perfect for this project!